This chapter explores the ways in which obesity is put forward as a medical (and moral) discourse, a problem caused by overeating and not enough exercise. 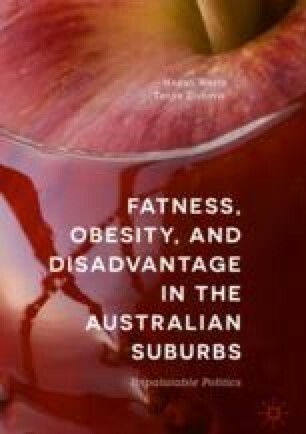 Within the epidemiological field, there is clear evidence of the social gradient in obesity, and the relationship between inequality and obesity is key to the book’s analysis. Despite the dominance of medical interpretations of obesity, different people have differing perspectives on fatness, and not everyone agrees that being overweight or fat is unhealthy. Moving beyond the well-developed social constructionist critiques of obesity, this chapter positions the arguments for the book in practice theories (Mol, The body multiple: Ontology in medical practice. Durham: Duke University Press, 2002), discerning coexisting patterns of fatness. Australian Bureau of Statistics (ABS). (2013). Australian Health Survey: Updated Results, 2011–12 [Internet]. Catalogue no. 4364.0.55.003. Available at http://www.abs.gov.au/ausstats/abs@.nsf/Lookup/4364.0.55.003main+features12011-2012. Accessed 14 Nov 2017. Australian Bureau of Statistics (ABS). (2014a). Community profiles. http://www.abs.gov.au/websitedbs/censushome.nsf/home/communityprofiles. Accessed 14 Nov 2017. Australian Bureau of Statistics (ABS). (2014b). Australian Aboriginal and Torres Strait Islander Health Survey: First Results, 2012–13. http://www.abs.gov.au/ausstats/abs@.nsf/mf/4727.0.55.001. Accessed 14 Nov 2017. Groves, T. (2008). National obesity strategy: What’s the big idea? British Medical Journal, 337. https://doi.org/10.1136/bmj.a2548.